Wet weather has brought much-needed relief to the ongoing effort to control the McHugh Creek fire in southeast Anchorage. The fire is holding steady at 842 acres, and is now 7 percent contained, according to Alaska Wildland Fire Program Manager Tom Kurth. 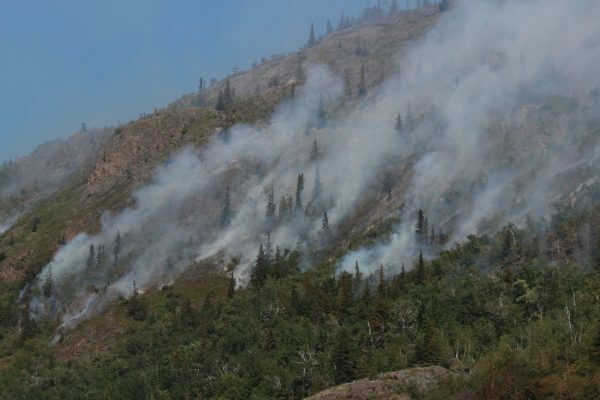 At a press conference Friday morning, Kurth said the rain that has moved into the area has been a big help to the 330 people fighting the blaze in the steep terrain above a stretch of the Seward Highway. And the forecast is looking good. Containment is still a labor intensive task, he said given the fire’s ragged perimeter. But the outlook is improving. The Blackhawk helicopters that were providing earlier air support have been called off, both lanes along the Seward Highway remain open, and there’s no immediate concern about evacuating residents in the nearby Potter Creek and Rainbow Valley areas. The cause of the fire is still unknown, but Kurth said input from locals is helping the investigation that’s underway. The public has been “very conscientious about taking photographs and showing us areas of possibilities,” he said, and investigators will be processing that information over the next 24 to 48 hours. One thing they don’t need help with is food. Kurth said while officials appreciate the thought behind the delivery of 30 pizzas to crews on Thursday, they’re fully equipped to take care of firefighters.